Iranian voters began casting ballots Friday in a colorful and passionate presidential election pitting incumbent President Mahmoud Ahmadinejad against Mir Hossein Moussavi, the leading reformist candidate. The polls opened at 8 a.m. local time (11:30 GMT) and will stay open for 10 hours, but that time could be extended. Raucous, lively political rallies filled the streets of Tehran as the campaign season officially ended Thursday. The streets were quiet late Thursday as posters bearing the faces of the top candidates were torn down, and graffiti proclaiming “Change, Change, Change” was washed away. It was a strange contrast to the scene in Tehran a day before when tens of thousands of Iranians took part in the final rallies on Wednesday. Most of the rallies were in support of Moussavi. As far as the eye could see, people walked for hours from east of the city to the west, converging on Tehran’s Freedom Square, which became the symbol of the Islamic revolution that swept this country back in 1979. 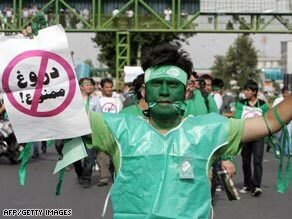 There were some Ahmadinejad supporters taking part in the rallies, but most donned the color green which is the symbol of Moussavi’s campaign. The Moussavi supporters stayed out well past the midnight deadline, dancing, chanting, driving and honking their horns. The rallies were largely peaceful. At one point, police fired tear gas to disperse the crowd, but the situation did not get out of control. People who are old enough to remember the Islamic revolution 30 years ago say this week’s rallies in the capital were the largest they had seen since then. Moussavi has energized Iran’s women and young people, and his supporters hope that will be enough to sweep him to victory. But much of his support is coming from those frustrated with Ahmadinejad’s four years in office, during which prices of goods have skyrocketed and personal freedoms have plummeted. “Thirty years of frustration is exploding,” said Mohamed, a mechanical engineering student who took part in Wednesday’s march to Freedom Square. “Even if Ahmadinejad wins, we are here just to express our opposition.” The Iranian president still has staunch support especially among the poor in the provinces to whom he has doled out money, benefits and favors. “Honestly, we have never seen anyone as courageous as Ahmadinejad,” said one of his supporters, who took part in this week’s rallies. CNN’s Christiane Amanpour reports emotions on the street » Moussavi’s supporters hope that he follows in the same footsteps as Mohammed Khatami, a reformist candidate who overwhelmingly won the presidency in 1997, raising hopes that the reformist movement would bring religious and democratic freedoms to the Islamic republic. But the real power in Iran rests in the hands of the Supreme Leader, Ayatollah Ali Khameni. Watch CNN review the unprecedented online presence of candidates » By the time Khatami left office in 2005, he was unable to make major changes due to the opposition of hardline elements in Iran’s clerical establishment. No matter who wins Friday’s election, analysts say it is unlikely that any of the candidates would change Iran’s position on its nuclear program, which the Islamic republic insists is for civilian purposes but the United States and other Western powers believe may be a cover for a weapons program. Iranian-American analyst and scholar Reza Aslan said that while Moussavi is “a little bit more of a moderate when it comes to the nuclear issue … all four candidates agreement with Iran’s right to develop nuclear.” Nevertheless, Aslan said that all four candidates also “recognize it’s time to open up to America and to the international community because there’s no other option with regard to the economy.” “But I think with Moussavi you have someone that I think would be more palatable for a Barack Obama to sit down next to,” he told CNN’s “American Morning.” The U.S. president has indicated his willingness to open dialogue with Iran — something his predecessor was unwilling to do. But talks with the incumbent Iranian president are more likely to trigger criticism because of Ahmadinejad’s controversial statements, including his repeated denial of the Holocaust and his comments about wiping Israel off the map.